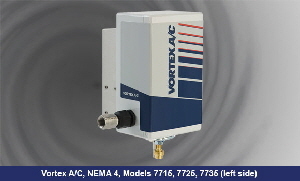 The Vortex A/C is available in 4 different cooling capacities, and ratings of NEMA 12, NEMA 4/4X and Hazardous Location Duty (Class 1, Div 2). 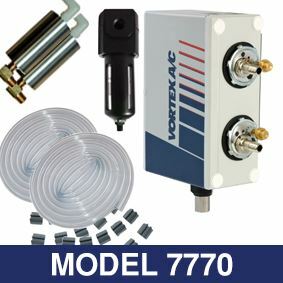 All of Vortec’s Enclosure Coolers keep Electrical and Electronic Enclosures cool, clean and protected and are a low cost alternative to expensive, high maintenance air conditioners; and avoid contamination with dirty, humid air caused by fans. 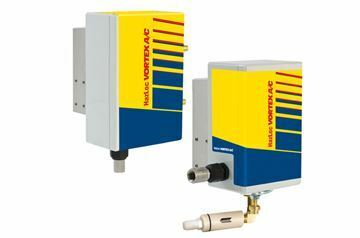 Today’s small, compact multi-function electronic controls, variable speed drives, servos and programmable logic controllers are extremely sensitive to heat and contamination. Smaller cabinet sizes make temperature control difficult and prone to premature failures. Excessive heat will cause digital displays to misread, controls to drift, and breakers to trip below rated loads. The result is productivity lost due to machine or line shutdowns. Vortex Enclosure Coolers maintain a slight pressurization in the cabinet to keep electrical and electronic components clean and dry; and most are thermostatically controlled to maintain enclosure temperatures within a specified temperature range. Avoid any downtime, with the most affordable, QUIET, reliable, and easiest to install thermal protection product available for electrical enclosures! The most affordable, reliable and easiest to install of any thermal protection product available for electrical enclosures! 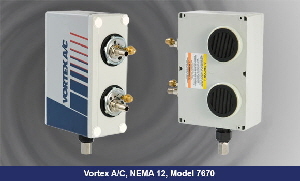 Just as quiet as an air conditioner (about 62 dBA), the Vortex A/C™ noise level is 73% less than other conventional, vortex type cabinet coolers. When the thermostatically-controlled Vortex A/C is operating, the decibel level is about the same as normal human conversation! 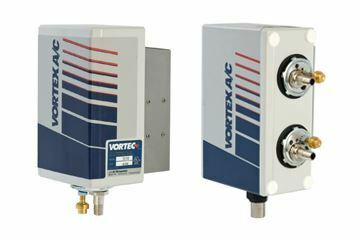 This next generation, Vortex Cooler features an integral mechanical thermostat to conserve energy and maintain enclosure temperatures within a range of 80° to 90°F. 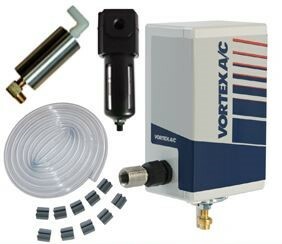 Requiring only a compressed air supply to operate, the UL listed Vortex A/C quickly installs in a 1.5″ knockout hole to keep electrical control panels cool, clean and protected. Using vortex tube technology, cold air is generated by the Vortex A/C from the compressed air supply and is distributed throughout the enclosure. Since ambient air never enters the cabinet, it’s perfect for harsh, dirty environments. 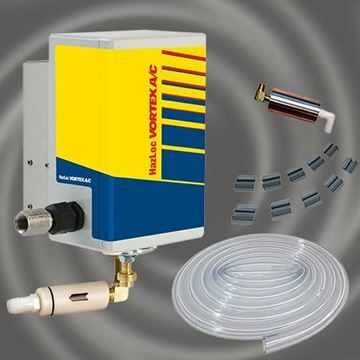 In fact, the Vortex A/C features an optional “purge-air” port that, when opened, will provide a constant positive pressure inside the enclosure to purge the cabinet of any contaminated surrounding air. Withstanding extreme temperature conditions, the Vortex A/C will provide reliable cooling operation in environments up to 175°F (79° C).